<strong>CLEAR VISION: </strong> Company cofounders Daniel Emmett (front) and Corey Hoven (back) peer through their product with their colleagues. The next time you walk by an office building or are inside looking out, pay close attention to the windows. Chances are they’re heavily tinted to reduce computer glare and to absorb heat, helping the building to stay cooler. In fact, many windows block half the sunlight entering a room, reflecting the rest of the solar energy back into the world. Four years ago, Daniel Emmett, an expert in energy efficiency and conservation with a background in commercial real estate, and Corey Hoven, a recent PhD graduate from the Materials Department at UCSB, teamed up with the simple yet groundbreaking idea to harness that extra power by turning windows into solar panels. They formed Next Energy Technologies, applied for federal grants, and settled into an office park behind Goleta Valley Cottage Hospital, where 14 chemists and engineers have toiled to create an entirely new generation of solar technology. 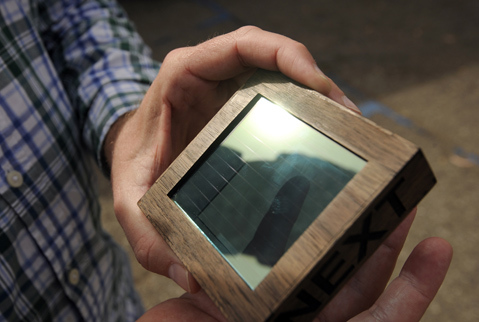 <strong>TINY BUT MIGHTY:</strong> A small sample of Next Energy’s solar window powers the fan behind it. 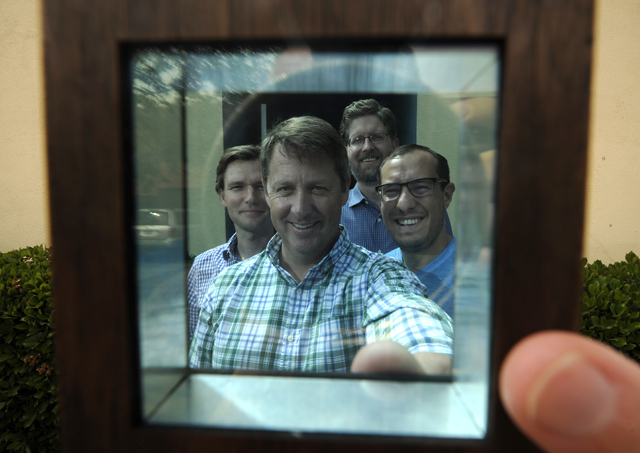 Now, said Emmett and Hoven during a tour of their labs last Thursday, Next Energy is on the cusp of breaking into the market with a transparent solar cell ink that can be printed directly onto standard dual-pane windows. The challenge was finding a solution clear and cheap enough for architects and building owners to adopt. And it had to pass batteries of efficiency and durability tests. “It’s been a long road to get here,” said Emmett. The small-molecule technology is based on organic semiconductors pioneered at UCSB under Alan Heeger, who won a Nobel Prize for his work in 2000. The window arrays will act just like a big solar field, connected in a grid attached to a power inverter. Some day down the line, the ink may be printed on flexible materials such as tents or awnings, or incorporated into roof materials. It may also be used for lightweight, portable generation in developing countries. Next Energy has succeeded where other developers failed, especially in cracking the code to make the product commercially viable. “We look better, generate more energy, and cost less,” Hoven summed up. “This is designed to be a no-brainer decision,” Emmett said. “Put in a normal window, or a normal window with this functionality.” They can also customize the ink’s color and transparency, which is applied when the window is manufactured. 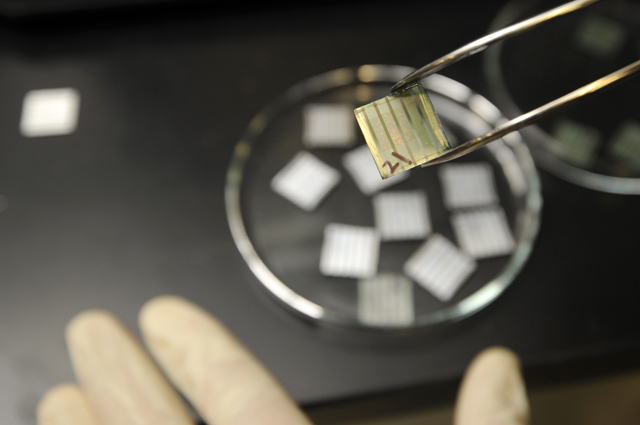 The active layer of the solar cells is only 100 nanometers thick ​— ​1/100,000th of a centimeter. That contrasts with bulky silicon solar panels, which use expensive, rare earth minerals that need to be mined and purified. 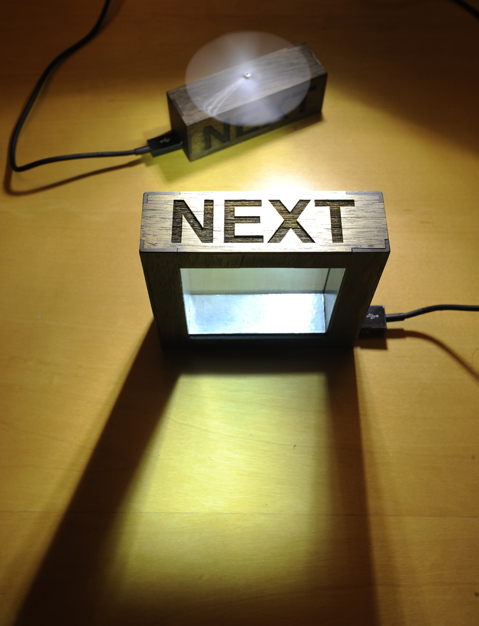 Next Energy will go to market with a 10 percent power conversion efficiency that will net 100 watts per meter squared. “That’s a meaningful amount of power, especially over the side of a building,” Emmett said, noting new buildings these days trend toward a higher window-to-wall ratio. He estimated the panel system would power around 20 percent of a structure’s energy needs; buildings consume 40-50 percent of our global energy. “This has the potential to have really meaningful reductions on the carbon footprint and power use of commercial structures,” he said. Though office spaces have done a lot to decrease their power demand in recent years, such as installing LEDs, incorporating smart heating and cooling software, and so on, there haven’t been any real options to produce on-site renewable energy. “We’d be the first to provide significant power,” said Hoven, which would allow business owners to save on their energy bills, especially during peak hours. Utility companies aren’t yet part of the conversation, said Emmett, though Next Energy has spoken with the California Public Utilities Commission about their project. If an architect is interested in the solar windows, Next Energy would analyze the proposed building’s location, orientation, and elevation, as well as the area’s utility rate and weather patterns. That will determine performance and payback. Emmett tells potential customers ​— ​which include some of the biggest window manufacturers in the U.S. ​— ​that the system can pay for itself in about a year. He expects his windows to be in buildings in around 18 months. As Hoven led a tour of the lab, he introduced chemist Braden Smith, a 2012 UCSB graduate who worked on similar technologies in school. Wearing safety goggles and an expression of deep concentration, Smith was hunkered over his laptop and workbench next to colored liquids steaming and swirling in glass beakers. Nearby were engineers Bruno Caputo, Rachel Harris, and Robert Manriquez, all UCSB graduates, as well, testing different solutions in enclosed solar boxes. Next Energy has also hired some of the best minds in the business from the National Renewable Energy Laboratory. In 2012, Congressmember Lois Capps toured the facility and praised Santa Barbara–area start-ups for creating jobs and enticing investors. At the time, many other U.S. solar companies were struggling to keep up with their global competitors. Next Energy was able to stay relatively lean and mean by buying its equipment at auctions and getting by without any venture capital.